TheCall Detroit ended its 24-hour event at Ford Field last night. I watched about 18 of the 24 hours and will post a more extensive follow up article tomorrow (Monday). In an article posted in local media since the event, an attendee said there were about 2000 people in the stadium. It did appear that the seats were almost empty. Participants also reported being impressed with the repentance of a former Muslim terrorist. That was Kamal Saleem, one of several debunked "ex-terrorists", who claim to be experts on counter terrorism and speak to groups on the "Islamization of America." The "reconciliation ceremony" was part of a choreographed ritual that is widely used by the apostles and prophets of the New Apostolic Reformation (NAR) and does appear quite impressive if you don't know more about the underlying agenda. TheCall and other NAR events mask a Christian supremacist agenda with elaborate rituals of repentance between races and ethnicities. These include emotional ceremonies that they call "Identificational Repentance and Reconciliation," a key component of their brand of "spiritual warfare" against what they view as competing faiths and belief systems that are controlled by demonic spirits. TheCall Detroit started with Native American dancers and music by Broken Walls. This is a band affiliated with "Carry the Cure," a faith-based suicide prevention ministry led by the Broken Walls drummer William Pagaran. Pagaran was included in a 2008 exposé by Bruce Wilson of Sarah Palin's faith-based mental health services and the band's stealth evangelism in public schools. See Palin Put Religious War Advocate on Alaska Suicide Prevention Council. On Friday evening, a series of reconciliation rituals began with repentance by a man described as a former Muslim terrorist. This was Kamal Saleem, aka Khodor Shami, who has traveled the country with two other discredited "ex-terrorists" Walid Shoebat and Zakaria Anani. They all claim to have been part of the Palestine Liberation Organization and present themselves as experts on counter-terrorism. Saleem had also spoken in September at an anti-immigration event at the Michigan capitol hosted by Michigan state Rep. David Agema (R-Grandville) and testified before the House Commerce Committee in favor of the E-Verify bill. A Michigan Messenger article overviews some of the debunking of Saleem's claims to be a reformed Muslim terrorist who converted to Christianity. "These men are frauds, but this is not the point. They are part of a dark and frightening war by the Christian right against tolerance that, in the moment of another catastrophic terrorist attack on American soil, would make it acceptable to target and persecute all Muslims, including the some 6 million Muslims who live in the United States. These men stoke these irrational fears." "These three jokers are as much former Islamic terrorists as Star Trek's Capt. James T. Kirk was a real Starship captain." "If their claims are true, these alleged ex-terrorists should be deported or prosecuted, unless our government now considers conversion to fundamentalist Christianity a reason to disregard prior terrorist activities. If their claims are fabricated, they have criminally defrauded every institution that has paid them to speak." Over the last year Saleem has been producing anti-Islamic videos for the Oak Initiative, based at Rick Joyner's MorningStar Ministries in Ft. Mill, South Carolina. The Oak Initiative also markets anti-Islamic books and partners with James Gaffney's Center for Security Policy in promoting anti-Shariah bills. Oak Initiative co-founder Samuel Rodriguez, who resigned from the board in August, has promoted Hispanic immigration to evangelicals as a way to slow what they claim is the Islamization of America, while the Oak Initiative fueled anti-immigrant fears. Rodriguez is president of the National Hispanic Christian Leadership Conference. Transformation Michigan, an Oak Initiative affiliate, was the state coordinator for TheCall Detroit and is led by Rick Warzywak. Both Warzywak and Rick Joyner spoke at the event. Saleem and Lt. Gen. William "Jerry" Boykin traveled to Michigan for pre-TheCall Detroit to speak at location around the state on the dangers of Islam. Saleem was featured in a Transformation Michigan/Oak Initiative conference call on September 20, 2010, titled "The Threat of Islam: A Cultural Jihad." I am still trying to figure out who Saleem was "repenting" to in the ceremony at TheCall Detroit. He was wearing a kippah (Jewish skull cap) and was described as Jewish, but prayed in "Yeshua's name." Engle and Bickle work with Messianic Jews (Jews who convert to Christianity but retain their Jewish identity) and promote something they call the Israel Mandate to proselytize Jews as part of their "end times prayer movement." For more on their vision of what is going to happen to Jews who don't repent of Judaism, see the video embedded in Bruce Wilson's recent article. I'm familiar with the major Messianic leaders with whom Engle and Bickle usually work; but I did not recognize this one and did not hear him being introduced. If a reader recognizes him, please let me know. [Update: He is Messianic Rabbi Jason Sobel.] Charisma Magazine's glowing article on TheCall Detroit simply refers to him as a "a Jewish leader." The Charisma article does note that Engle has been "involved in identificational repentance for decades." The uninitiated are easily drawn into these well-choreographed events, complete with tears (and mascara running down Cindy Jacobs face). TheCall Jerusalem in 2008 was dedicated to similar reconciliation ceremonies between Jews and Gentiles, but all the Jews were actually evangelized Messianics who run Messianic ministries in Israel and elsewhere. At Rick Perry's August 6 prayer event, orchestrated by Engle and Bickle's TheCall and International House of Prayer staff, the prayer for Israel was led by Apostle Don Finto, who called for the conversion of Jews in Israel and the world. He was then joined by prominent Messianic Rabbi Marty Waldman. Other prayers at the event included pleas for the heart of "Barack Hussein Obama" to be turned toward Israel. In addition to Lou Engle and Mike Bickle, leading apostles and prophets at the event included Cindy Jacobs, Che Ahn, Rick Joyner, Will Ford, Mark Gonzales, and Barabara Yoder. I've posted a second article in this series on Kamal Saleem claiming that President Obama wants Shariah law. Watch for my post tomorrow with more about TheCall Detroit, and why it matters. -Previous article on the Oak Initiative titled Samuel Rodriguez and the Oak Initiative: Marketing Religious Supremacism as Social Justice. Thanks for all the work. Somebody had to do it. I'm heartened a bit with the info that they didn't exactly fill the place up. I haven't seen anything in the news about any protests at TheCall: Detroit. and it was in the press. For example, see this Detroit Free Press article. The Charisma article says the crowd "dwindled slightly" from the opening 30,000. This is a very wide variance from a count of 2000 attendees mentioned in the local news article. Odd. ... I would say the actual number was closer to the 2000 estimate. Rachel, I am a great admirer, and as such, I'd like to point out an "ouch" -- the incorrect punctuation of the word "it's" in your opening sentence. I know you know better, so I'll assume it was an editor's choice to alter your original, or at least I certainly hope so. Keep up the GREAT work in following TheCall and others surrounding these issues! Thank you for being diligent even in the face of criticizm. It was my error. I will plead exhaustion or whatever after watching 18 hours of TheCall Detroit! Thanks! I'm always happy for readers to inform me of typos or mistakes. 18 hours? wow, that's more than I could handle, I get outraged just reading this stuff. It seems to me that there are similarities between the tactics, and perhaps the motivations, of these fraudulent "ex-terrorist-Muslims" and those who claim to be "ex-gay." Both draw on the I-once-was-lost-but-now-am-found narrative to make their claims believable. Both are intent on manipulating believers into an extremist right-wing mindset. So I have to wonder if there are other groups of "ex-something-or-other" who are engaged in the same kind of fraud, for the same ends. Is this a technique of manipulation that is being shared among right-wing religionists, or are these simply two similar but unrelated phenomena? The Messianic rabbi is Jason Sobel. 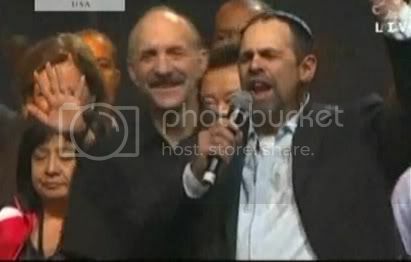 Following is a link of Sobel at TheCall Sacramento in 2010.